Iran’s Supreme Leader accuses Saudi rulers of committing treason by aligning themselves with the United States and Israel. 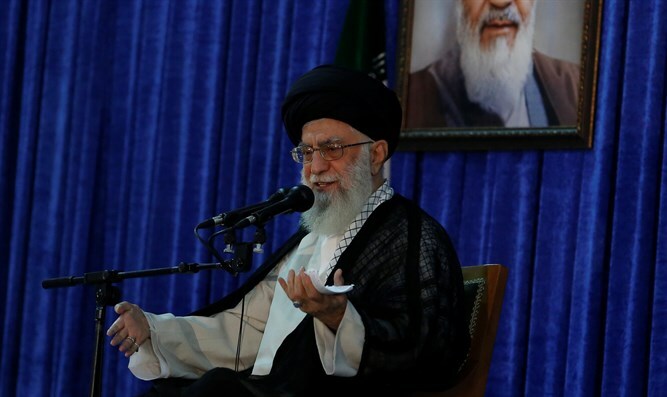 Iran’s Supreme Leader, Ayatollah Ali Khamenei, on Tuesday accused Saudi rulers of committing “treason” against Muslims by aligning themselves with the United States and Israel, Reuters reports. Addressing parliamentary representatives from Islamic countries gathered in Tehran, Khamenei said the U.S. decision to recognize Jerusalem as Israel’s capital was “a big mistake” and “doomed to failure”. “Regional governments that are cooperating with the United States and the Zionist regime to fight against Muslims are certainly committing treason. That is what Saudi Arabia is doing,” Khamenei charged. Iran, the leading Shiite Muslim power, and Sunni Muslim Saudi Arabia, a key U.S. ally, are regional rivals. Khamenei’s accusations come amid ongoing reports that Saudi Arabia and Israel are getting closer, perhaps due to their mutual concern over Iran. One recent report claimed the Saudi government is weighing the possible normalization of relations with Israel ahead of a planned Middle East peace program by the Trump administration which aims to not only secure a final status agreement between Israel and the Palestinian Authority, but lead to recognition of the Jewish state by the larger Arab world. Another report implied that Saudi King Salman plans to step down and announce his son as his successor, and that once the Crown Prince becomes king, he would enlist the help of the Israeli military to crush Hezbollah, Iran's proxy in Lebanon. Saudi officials have repeatedly denied any ties with Israel, insisting that Israel must accept the so-called Saudi peace plan in order for the two countries to enjoy close ties. Some of the reports about covert relations between Saudi Arabia and Israel were disseminated by Iran itself, which claimed that the Israelis and the Saudis had teamed up to sabotage Iran’s nuclear program. Iran does not recognize the State of Israel and its leaders, including Khamenei, repeatedly threaten Israel and call for its destruction.